Samsung has added more handsets to their smartphone range and these two new phones give you a choice of a mid range device or entry level budget friendly one. The Samsung Galaxy A5 is the higher spec model of the two newly announced handsets with a 1.2GHz processor and 2GB RAM. The 5-inch HD Super AMOLED display delivers great graphics and picture quality so this handset is good if you like watching movies or video clips on your mobile. There is 16GB of on board memory and a microSD card slot so you will have plenty of space for your music, videos and photos. The camera on the Galaxy A5 is a 13-megapixel lens so you can be assured of great photo quality and if you are a selfie fan the front facing 5-megapixel camera is bound to please. 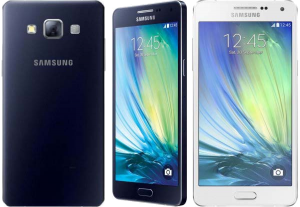 The Samsung Galaxy A3 is the budget handset announced at the same time as the A5. This pocket friendly phone has a 4.5-inch display along with a quad-core processor and a scaled down 1GB RAM. The snapper on this handset is an 8-megapixel one but the front facing camera is the same 5-megapixel lens featured on the higher end phone. The Galaxy A3 has a smaller 8GB memory on board but with a microSD card slot included you can make more space should you need it. The Samsung Galaxy A3 and Galaxy A5 will be both be on offer in a number of colours as well as an all metal design too. The handsets are set to hit the shelves this month, but we don’t have full confirmation on where exactly they will appear first so it may take some time before they hit UK shores. Do you like the look of these phones? Would you buy one of these handsets? Share your thoughts with us by commenting below or join the conversation on Google+.